Oil-Electric: Almost went to Mexico! Union Pacific 1499, Argo Yard, Seattle June 14, 1962. Argo Yard was easy to “pre-screen.” As we drove south across the Georgetown Viaduct, looking to the right we could see if there was power down there or not. If not, continue southbound to Milwaukee’s Van Asselt Yard. Being more of an interchange than a yard, per se, road power was rarely seen there, having made their drop in the middle of the night. Maybe see a switcher, and that only if they had completed their chores. Some time ago, I detailed the yards that served Seattle during my “railroading” years, and discovered several yards had interesting backgrounds. Then I got to Union Pacific’s “Argo” yard, and found the source of its name plainly straightforward! Alas, all of this history, all of the individual qualities that made railroading in Seattle what it once was began to crumble with the Burlington Northern Merger. Today there is absolutely no motivation on my part to go over to Seattle to photograph trains – everyone is shooting the same toaster ovens, of questionable ancestry. Back to the 1499. 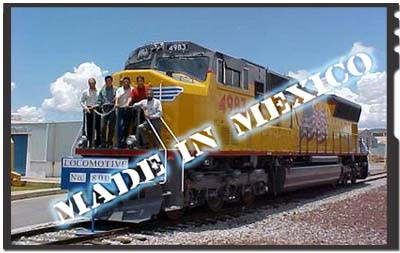 Apparently, Mexican National Railways (NdeM) had placed an order for two General Motors FP-7A’s. They were built for NdeM as 9103 and 9104. 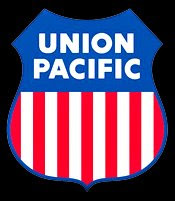 The railroad defaulted on the order – no dinero – so Union Pacific picked up this unit and her sister 1498, nee NdeM 9103 in May of 1952. Railroad Stuff: Union Pacific 1499, nee NdeM 9104, build as an FP7A by General Motors in La Grange, Illinois, April 1952, serial number 17234. 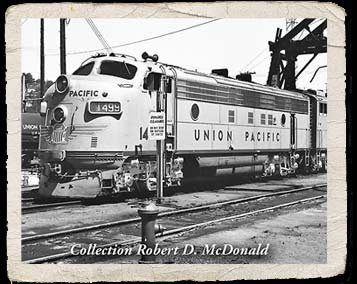 When NdeM defaulted, sold to Union Pacific in May 1952. Removed from passenger service and regeared for freight service in 1956. 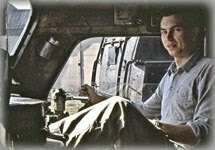 Retired to General Motors on a trade in program in 1964.